[S612] GRO Scotland, birth/bapt record, District of Ardchattan, Statutory Births, GRO 504/00 0015. [S189] International Genealogical Index (IGI), Entry C115041/0187, film 1041003, Argyll. [S340] Census - 7 Apr 1861, UK census, Scottish GRO 504/00 003/00 002. [S128] Cemetery Marker - Dugald McColl / Catherine Sinclair/Dugald McColl (son)/Christina McInnes/ Marion McInnes, Achnaba Churchyard, Argyll, Scotland. [S918] GRO Scotland, death record, District of Dennistoun, Statutory Deaths, GRO 644/03 1797, aged 18. [S612] GRO Scotland, birth/bapt record, Parish of Ardchattan, OPR Births/baptisms, GRO 504/00 0010 0058 FR64; note that this birth is to John and Mary, and may not be the correct one. [S612] GRO Scotland, birth/bapt record, Parish of Ardchattan, OPR Births/baptisms, GRO 504/00 0010 0058 FR64; note that this birth father has been recorded as John but is extremely hard to read. [S917] GRO Scotland, marriage record, District of Inverkip, OPR Marriages, GRO 567/00 0020 0311 FR758. [S612] GRO Scotland, birth/bapt record, District of Ardchattan, Statutory Births, GRO 504/00 0008. [S118] Census - 30 Mar 1851, UK census, Scottish GRO 504/00 003/00 002. [S918] GRO Scotland, death record, District of Ardchattan, Statutory Deaths, GRO 504/00 0014, aged 44. [S367] Census - 2 Apr 1871, UK census, Scottish GRO 644/06 017/00 017. [S918] GRO Scotland, death record, Parish of Ardchattan, Statutory Deaths, GRO 504/00 0013, aged 65. [S612] GRO Scotland, birth/bapt record, Parish of Ardchattan, OPR Births/baptisms, GRO 504/00 20 108 (FR200). [S189] International Genealogical Index (IGI), Entry C115044/0946, film 1041003, Argyll. [S443] CD - NZ Marriages, CD - NZ Marriages 1836-1956 V2, 1875, folio 1387. [S924] BDM Registrar of New Zealand, marriage record, Reg. No. 1875/1462. [S419] Christchurch City Council Cemeteries database, at http://librarydata.christchurch.org.nz/Cemeteries/, Addington Cemetery, plot 348B, aged 39; a search in Apr 2018 could not find a headstone. He served in WWI in the Rifle Brigade of the 1st NZEF (#51857), H Co reinforcements, embarking on 12 June 1917. [S542] Index - New Zealand BDMs online, at http://www.bdmhistoricalrecords.dia.govt.nz/, Birth Reg. No. 1881/12640. [S597] Auckland War Memorial Museum Cenotaph database, at http://www.aucklandmuseum.com/war-memorial/online-cenotaph, gives a next of kin as Mrs I McColl of 51 Victoria St, Christchurch. [S542] Index - New Zealand BDMs online, at http://www.bdmhistoricalrecords.dia.govt.nz/, Death Reg. No. 1938/28506. [S369] Personal knowledge of D Ferguson, as documented by A Ferguson Oct 1989. 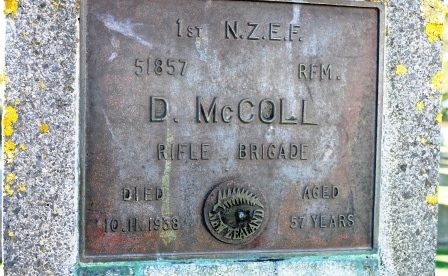 [S138] Cemetery Marker - Duncan McColl, Bromley Cemetery, Christchurch, NZ. [S419] Christchurch City Council Cemeteries database, at http://librarydata.christchurch.org.nz/Cemeteries/, Block 6, Row 1 (RSA section). [S612] GRO Scotland, birth/bapt record, District of Renton, Statutory Births, GRO 494/2 147. [S612] GRO Scotland, birth/bapt record, District of Renton, Statutory Births, GRO 494/02 0147. [S430] Census - 31 Mar 1901, UK census, Scottish GRO 494/02 006/00 018. [S687] Census - 2 Apr 1911, UK census, Scottish GRO 494/02 006/00 020. [S612] GRO Scotland, birth/bapt record, District of Renton, Statutory Births, GRO 494/2 47. Hugh died before 1911 in Scotland as his wife was a widow in the 1911 census. [S189] International Genealogical Index (IGI), Entry C115044/0947, film 1041003, Argyll. [S612] GRO Scotland, birth/bapt record, District of Cardross, Statutory Births, GRO 494/00 0032. [S917] GRO Scotland, marriage record, District of Bothwell, Statutory Marriages, GRO 625/1 39. [S116] Census - 3 Apr 1881, UK Census, Scottish GRO 644/08 061/00 002. [S178] Census - 5 Apr 1891, UK census, Scottish GRO 494/02 003/00 018. Hugh died on 7 February 1936 at age 52. [S612] GRO Scotland, birth/bapt record, District of Renton, Statutory Births, GRO 494/2 86. Hugh McCOLL was born at Appin in Argyllshire. A farmer and brewer (according to son Dugald's death certificate); alternatively his occupation is shown as Weaver on Dugald's birth entry, if we have the right man! [S917] GRO Scotland, marriage record, Parish of Ardchattan, OPR Marriages, GRO 504/00 0010 0110 FR116. Isabella McCOLL was born circa 1848. (Birth date based on age at death of 75). 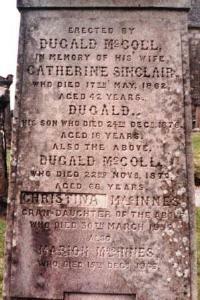 She was widowed on the death of her husband Duncan in January 1889. [S542] Index - New Zealand BDMs online, at http://www.bdmhistoricalrecords.dia.govt.nz/, Death Reg. No. 1924/7001, aged 75. [S419] Christchurch City Council Cemeteries database, at http://librarydata.christchurch.org.nz/Cemeteries/, Addington Cemetery, plot 348B, aged 75; a search in Apr 2018 could not find a headstone.